Last night, Thursday 11th October, the Society welcomed Dr. Mehreen Chida-Razvi from SOAS to lecture on “The Mughal Madonna: Representations of the Virgin in Jahangiri-era Architecture” in which she queried the reasons for depictions of the Virgin in this era. She examined the politics of the images, the patronage of Jahangir and his queen, Nur Jahan, and the symbolism behind the use of the Virgin. Of course, the talk was illustrated with some beautiful examples of how artists used light and colour in their representations. Earlier in the week, on Tuesday 9th, at a guest concert, the lecture theatre resounded with the sounds of Chalpasah – Japan’s only Afghan band. 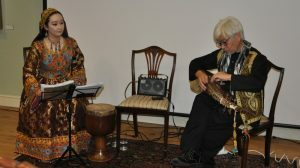 After being introduced by Professor John Baily, they amazed and enchanted the audience with their skillful singing and playing of traditional instruments. Everyone really enjoyed the opportunity of hearing such a unique band and seeing also their wonderful costumes. This week, also saw the announcement of the opportunity of a potentially fully-funded doctoral studentship. 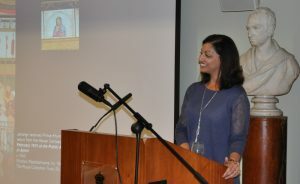 The Department of History at Royal Holloway, University of London, and The Royal Asiatic Society welcome applications from students for a PhD studentship to be funded (if the application is successful – the project is through to the second round) by Techne under its Doctoral Training Partnership Scheme, to begin in October 2019. The deadline for applications is Monday 5 November 2018 at 17.00. Shortlisted applicants will be interviewed later in November, and one selected to be included in the second-stage Techne application process in Spring 2019. The Project will be : From ‘orientalist’ learned society to a knowledge-exchange forum? : the Royal Asiatic Society, 1823-2023 will be supervised by Professor Sarah Ansari, Reader, Deaprtment of History, Royal Holloway, in collaboration with Dr Alison Ohta, Director of the Royal Asiatic Society. For details see our website. 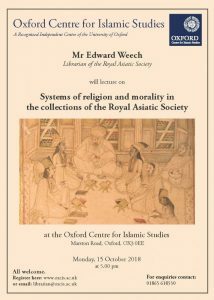 On Monday 15 October, 5 pm, RAS Librarian, Edward Weech, will be lecturing at the Oxford Centre for Islamic Studies on “Systems of Religion and Morality in the Collections of the Royal Asiatic Society”. He will examine selected treasures from the Society’s collections to make some suggestions about the approach of British Orientalists to the study of religion; how this related to eighteenth-century Enlightenment historiography and philosophy; and how this approach may have developed over the course of the nineteenth century. From this he will consider the Society’s collections in the wider context of British interest in foreign cultures and traditions, and ideas about public morality and religious pluralism. If you would like to attend this event please register your interest with the Centre. The next event at the Society will be on Tuesday 23 October at 6.30pm when Peter Hibbard from RAS Shanghai will lecture on “More than a Stuffed Bird Show: The RAS Legacy in Shanghai”. We hope you will be able to join us to learn more about the history of this allied society.